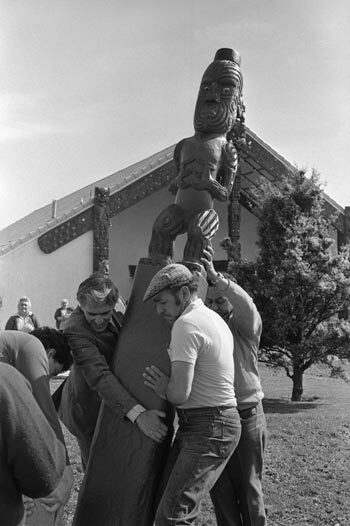 In 1985, 10 carved pou (posts) were installed at Waiwhetū marae, Lower Hutt, as part of the marae’s 25th anniversary celebrations. This pou represents Īhāia Pōrutu Puketapu, a prominent local Te Āti Awa chief. Waiwhetū has been settled by Te Āti Awa people since the 1830s, when Ngāti Mutunga chief Patukawenga made it available for migrants from Ngāmotu. The Waiwhetū marae was established in 1960 to cater for the large numbers of Māori coming to Wellington to work.